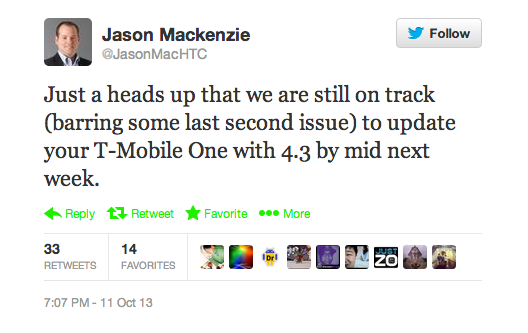 Earlier this month HTC teased the masses with a tweet on the Android 4.3 update for their flagship HTC One. The tweet, posted on October 2nd offered up a mid-October date for T-Mobile and now HTC is ready to make good on that timeframe. A tweet late yesterday from HTC America President Jason Mackenzie stated the T-Mobile update should release “by mid next week.” Of course Mackenzie prefaced that with a warning: “barring some last second issue” which makes perfect sense. We all know that last second hiccups can happen with updates so the comment isn’t any cause for concern. The update will include new lock screen widgets, numeric battery levels in the status bar, a new quick settings panel in the notification bar, options to configure the home button (hooray), improvements to the camera (always welcomed), and an easier to manage file format for Zoe clips. Sounds like a good way to start the second half of October. Ahead of Samsung, for once. To counter your silly comment, realize that Samsung is also working on getting 4.3 on all of last year’s flagships & many of this year’s mid-rangers too. Don’t forget all the tablets they’re updating too. Exactly how many phones do you think HTC is worried about getting 4.3 on? I’ll give you a hint. Not many. Samsung is also a much larger company with many many more software engineers. I suppose that should excuse HTC’s shoddy update history then. Well at least theyre updating their flagship phones early and as promised. Maybe its not going to be early for every HTC phones but im sure they will update most of their recent phones. When has Samsung EVER simultaneously released an OS update? You need a hint. All Samsung needs to focus on is SG4 first, as my comment entailed. Excited to finally receive this update on an already Awesome performing device. I have the HTC One too but i’ve been noticing a problem.. sometimes when i open up the camera it is frozen on a dark image the camera first sees…. won’t move at all.. the only fix is to restart the entire phone which is annoying. Has this happened to you? hopefully this will be fixed in the update. No, I haven’t had that happen to me before but I have occasionally had that Purple effect in dark photo’s. Doesn’t always happen but when it does, it’s extremely annoying. Hmm i never got any purple effect. Nope, if its a recurring problem you should prob get a new one. It means its defective. Hasn’t happened to me or the purple effect. Ask to get it repaired or replaced if you have premium handset plan. My body is ready….I just hope that this won’t be the last update. I know that HTC feels they have something to prove and will continue updating the One well into 2014, but T-Mobile will want you to buy a new device and probably block any additional updates. Yeah, the way I got the 4.3 upgrade on my Note 2 was buying a Note 3. I figured there was zero chance of the Note 2 ever seeing an upgrade if I hadn’t already seen one in the year I had owned it. There’s already a leaked build of 4.3 for the Note 2 and is supposed to be coming out very soon. Also, you’re phone did get an update this year, going from 4.0 to 4.1.2. Actually, no. The Note 2 was the first non-Nexus phone to debut with Jellybean. But, you’re right about 4.3 being on the horizon. ^What he said. But I don’t trust “on the horizon” until I actually see it on my device. 4.2 and 4.3 have been out how long?!? That is like saying ” I’m never going to get paid for last week. Do you see the money in my account? I don’t trust my work until the money is in the account”. They have leaked official roms. Those aren’t leaked until it’s close. So it’s on the horizon. So you assume the money is in the bank even though it isn’t there yet? Wow! That sounds like a horrible idea. I assume I will get paid because I was told I would and I worked the hours I should be getting paid for. You were told you will be getting a 4.3 release and signs show pretty well that it is being worked on since there was a leaked rom. Now if you are going to get all the features you want is the only thing you have to worry about. I never know the exact amount of money I’m going to get but I have a pretty good guess. That’s pretty poor planning on your part to assume that then. I like the disable Blink Feed, not because Blink was annoying, just because id like another home screen. I didn’t dislike it, but I don’t do social networking stuff that much (I have a G+ because you have to for some Google stuff). So I didn’t need something like that. I have been using Android a while but I never got into using widgets all that much, probably because back in the day it slowed the phone down and drained battery fast. The widgets have gotten better with the newer phones. I use almost all widgets on my home screens, not all widgets. The weather channel, Google Search, Yahoo Sports, Google Song Search, Facebook, and Twitter. The other icons are just home screen shortcuts for Gmail and settings. Other than that i just keep a picture on my homescreen, no icons at all on the main screen, just a picture of me and my wife. The battery drain is minimal from what i can tell. Why bother with using sense if you need more home screens? Just use nova or apex. More customizable with gestures. Did I miss something? No you didnt miss anything, i dont want to use another launcher, ive had a bad experience with one or two of them. I just figure with Blink disabled, thats another home screen open. And then there’s the KitKat.. Damnit, always 1 step behind. They’ll probably skip KitKat and release another update when Android 4.5 comes out. Doubt they’ll even get that. The HTC One X, last year’s flagship phone, will not be getting 4.3. Tech news sites are saying that HTC is no longer updating last year’s phone, which if HTC stays the course then the HTC One will get the KitKat update but then abandoned after that. I think the phone will at least get the next 2 updates after 4.3, but then again who knows. There wil probably be more advanced phones to buy by then and we wont care that the phone wont be updated. Some of us have tmobile jump, I can jump every 6 months. No big deal. True, i still want to get JUMP. Itll make it easier to upgrade if i want to 6 months from the time i get it. Can’t be behind when KitKat hasn’t been released yet. The Kitkat hasn’t been released yet and so the 4.3 HTC ONE.. It is behind. What you said makes absolutely no sense (no pun intended). If you were Touched by a Wiz you’ll understand! Me thinks I smell a troll. Once 4.3 is out, this is a non issue, get over it. Then everyone except Note 3 will be waiting for 4.4. Of course most of those ‘new’ features mentioned were actually from 4.2.2, which other carriers have had for…ages. You got really butthurt because 5 random people over the internet downvoted your comment. Lemme guess; since you comment didn’t answer the question or otherwise contribute, you must just be a really big fan of drama? Look, 8 downvotes now. Your life must be flashing before your eyes. Quick, get to a hospital before you faint. You talk about contributions but here you are, beating on a dead horse. We all know Tmobile is late with the update. Do we need to be reminded by some turd on the internet over and over again? No. Enjoy your downvotes, moron. Bang. Dead ringer. I nailed it. The boy likes his drama. One complaint and suddenly I’m a “moron” and “butthurt”. I just upvoted you. Breath a sigh of relief. Edit: Also http://forum.xda-developers.com/ Maybe if you weren’t such a big idiot you would have had 4.2.2 a long time ago like the rest of us. “Dead ringer”.. by a long shot. nt. No HTC ONE’s in any carrier had 4.2.2. HTC skipped 4.2.2 and went straight to 4.3. Everyone knows that. Android 4.2.2 was a minor, minor update. The fact that other carriers have it is irrelevant. The fact that HTC decided it wasnt important enough to update to and to skip it all together is the most important fact here. False. The give-away? Every feature listed in the article above was introduced in 4.2.2. Did you not just claim no carriers had it?? (looks at first quote) Yep. You did. Sorry, but there’s more than one country in the world, and a great many HTC One users started receiving 4.2.2 *from HTC* in July. Sorry, but some Myths….I just can’t believe. No. Simply not true. The HTC One 4.2.2 OTA started rolling out internationally to the HTC One direct from HTC in July of this year, starting with Taiwan. Look it up. How about the majority of the planetary population, for starters. You do know that most of the planet’s population resides outside of the US, right? Why do you think most new devices launch internationally before they get to the US? I’d liked to have had both from T-Mobile. I bet if you were honest with yourself you could admit that you would have liked that too. And it was most certainly possible considering the international version saw both 4.2.2 (which we never did) and still got 4.3 ahead of us. Please show me where I said anything of the sort. I said that all of the features listed in the article above were introduced in 4.2.2. In what bizzarro universe does that remotely equate to “4.3 is the same as 4.2.2”? I won’t, but I can virtually guarantee that most of the features in 4.3 find their way into 4.4. You seem like the type of troll that has to get the last word, but whatever dude. Im not wasting any more of my manual dexterity typing to an egotistical idiot. Have a nice life. Phoenix, they did say they are skipping over. Dont do it dude, Phoenix will not rest till he has the last word. God forbid we disagree with him. Its like beating your head against a brick wall. The main point of my original post: The article suggests that T-Mobile will introduce 4.3 with a list of nifty new features. Unfortunately, every single feature listed was introduced in 4.2.2. They aren’t new. Most HTC One devices have actually had these features since July. Users who ROM have likely had them even longer. The implication (not the main point, but it was implied) in my OP, which is what it seems most people ran with, is simply that: We got cheated. HTC has two variants of 4.2.2 (Sense) released; The international/Dev Edition OTA and the one that launched on the Verizon HTC One. My disappointment (the feeling of being cheated) stems from 4.2.2 being released by HTC back in July, but not to US carriers until Verizon launched their HTC One. Now, they introduce “4.3” with all these spiffy new features…that were all part of 4.2.2….that we could have had back in July had they allowed it. Yes. HTC America skipped, mostly (VZW? ), 4.2.2. Their reasoning? To focus on bringing us 4.3. Did we get it any quicker? I sarcastically “thanked” T-mobile for the “new” features. I wasn’t trying to imply that it was TMob who held back the 4.2.2 update (not that they couldn’t have fought like hell for it, which may or may not have worked for them). tl;dr – I love my HTC One. My JUMP! upgrade is coming up and I am seriously considering not using it and sticking with the One. That said, I could definitely like how HTC handled the OTAs quite a bit more than I currently do. This is great! I’m getting ready to get an HTC One. I’ll wait a little longer until it’s finally here. HTC One has major microphone issues. I would avoid it at all costs. That is a retarded comment. Some of them have microphone issues but not all of them. I have no issues with my microphone, the only issue I have is the all-too-common purple tint on my camera. I had microphone issues with a handset but I quickly replaced it. It’s been generally ok so far with the new handset. Sounds like a defective unit. Bring it back and get a new one. People that keep defective equipment and complain like its a manufacturer problem irk me. No Sense 5.5 – just flash Maximus HD, Android Revolution 30, or Viper 3.0 and you get Sense 5.5 on a 4.3 base. The new keyboard is sick too. I am flashing Sense 5.5 on my Tmo tonight. What Android 4.3? That was many months ago ant it?